and bought a small pie pumpkin yesterday at Whole Foods so I could experiment with a new raw nut-based pie I've been dreaming up. We don't have fresh pumpkin in our apartment very often, but we always have a few cans of organic pumpkin puree in our cabinet, even in the summer, since it's a great supplement to add to our puppy Trout's food when he's having a bit of stomach trouble. So this morning, when I opened the fridge and saw a half-filled can on the top shelf I decided to switch up my morning breakfast routine and recreate the pumpkin pie flavors I'd been craving all week in a smoothie. 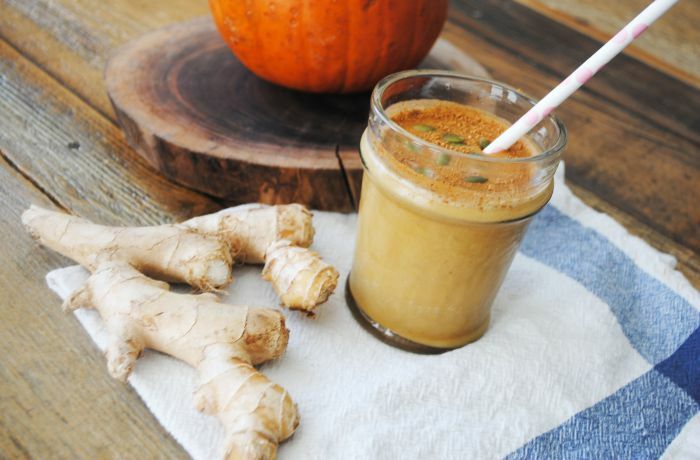 This smoothie is the perfect "it's the end of summer beginning of fall" drink. It's refreshing and sweet, yet earthy and spicy. 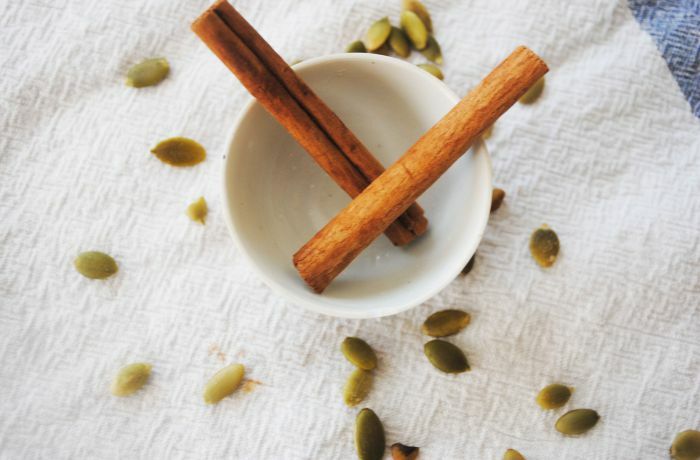 Plus, all of the classic ingredients in pumpkin pie (pumpkin, cinnamon, ginger, cloves and nutmeg) are incredibly good for you and full of vitamins and minerals. 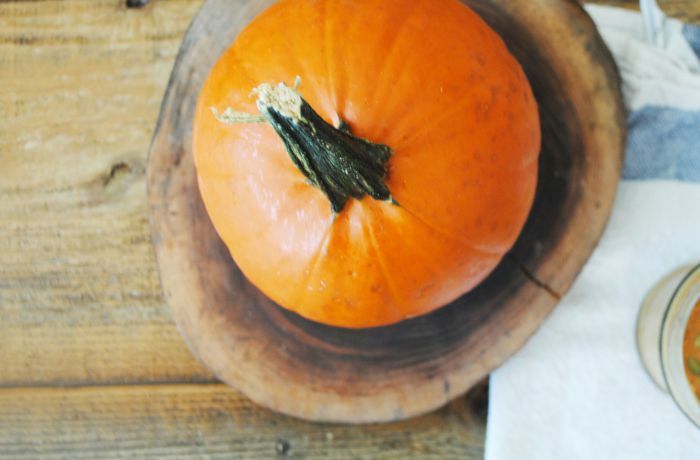 Pumpkins are incredibly high in carotenoids and Vitamin A (just like carrots) which can help inhibit the development of cancer and improve eyesight. The spices in this recipe are known for their anti-inflammatory properties, as well as being good for digestion. If you don't have frozen coconut water ice cubes (I highly recommend this for ALL smoothies), you can use regular ice cubes instead. Feel free to use any milk substitute here as well - I imagine coconut milk would be delicious! Combine all ingredients except for pumpkin seeds in a high speed blender or vitamix and blend until smooth. 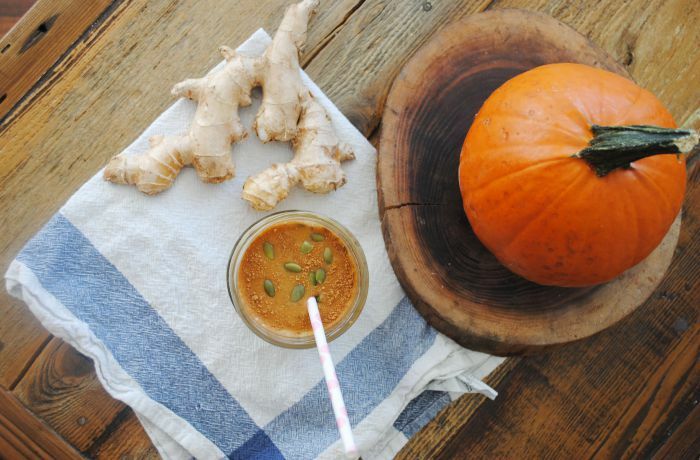 Pour into glass and top with raw pumpkin seeds. Drink immediately.